The last day of Kozakov was looking promising. Sunny weather, stacked heats and tons of people along the track. Like every day, the day started with 2 warm up runs for the bracket A. The other categories (luge, women, masters and juniors) would enter later during this bracket, so all finals would be held at the same time. 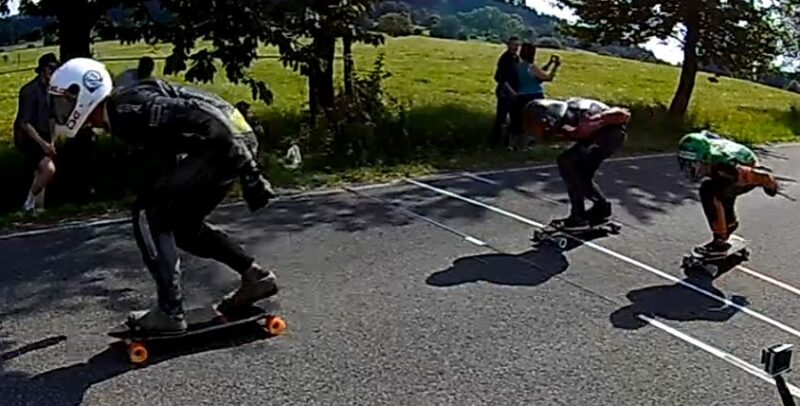 One of the riders, who obtained the wild card by finishing top 5 in B-bracket was (IDF board member) Patrick Switzer. Since this was the only race of his season, he qualified low on purpose (in fact he had the slowest time of all), so he would be in the c-bracket so he could (try to) skate his way into A-bracket and skate more runs. His plan almost backfired because of the amount of riders. We now had exactly a full A, B and C bracket. Would there have been 1 rider more, then he would be out of the bracket and he did it all for nothing. This was not the case and he made it all the way to round 2 of A, before getting eliminated by Micah Green and Pete Connolly. In heat 13 of round 1, Emily Pross was up against Douglas Dalua, a battle of 'the machines'... and Emily came out on top which was met with respect and cheers on the start line. She beat Dalua, but in the next round, where they were up against Ian Freire and Alfred Cano Rivas, Ian finished first and Dalua second. Quarter finals A, B an C were themed Brazil vs Sweden, with Carlos (Paixao) vs Mauritz (Armfelt), Tiago (Mohr) vs Adam (Persson) and Douglas (Dalua) vs Erik (Lundberg), but this round changed nothing, since they all advanced. 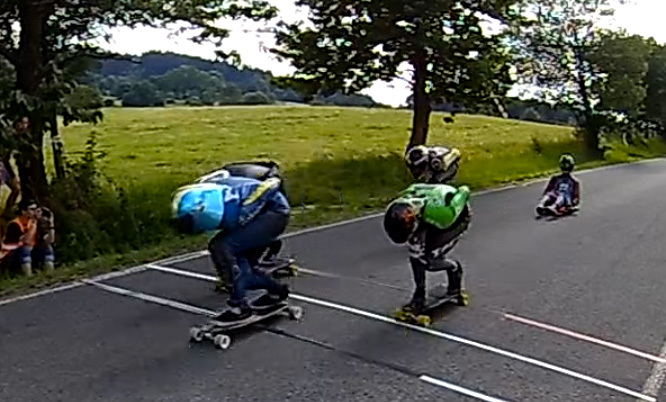 After a fierce race down the hill it was Adam who triumphed over Thiago, Carlos and Aaron, by only a few inches difference. 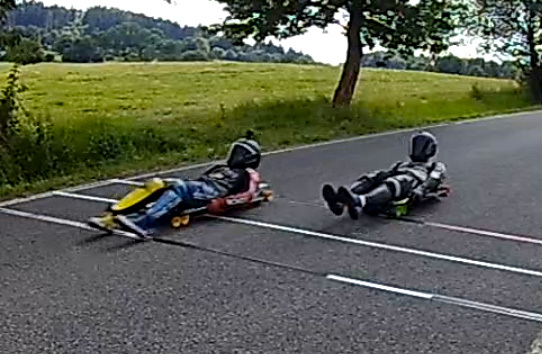 Thiago and Carlos were so close, we had to double check using a video recording (see screenshot), where you can see there only a wheel length apart. Adam was very emotional after finishing the final, because even though he is a world champion already, he had never won Kozakov, which is sort of like a cherry on top. Also in the women's final it got quite exciting. After a 1 round repechage, the women did their 16 (wo)man bracket, which ended in the final with Emily Pross, Lyde Begue, Cassandra Duchesne and Susan Heine. Emily is so on top of her game that when she crossed the finish the other 3 girls were just coming down the last hill after the last corner. Side by side they came charging at the finish line, which had to be decided by video footage because as you can see it was very close. In luge there it was no big surprise that the holder of the track record, Mikel Echegaray-Diez, finished first, while sitting up and waiving to the cameras. Abdil followed about a second later but the real battle in luge was for 3rd and 4th between Kolby Parks and Alexandre Cerri Machado. Also here it was only a few wheel lengths in difference. The same thing was happening in juniors. Knox Heslop finished first, with Ed Kiefer at about a second behind, but the battle for 3rd and 4th between Vojta Zacek and Tristan Cardillo was a close one, where Czech crowd favourite Vojta crossed first. And again with masters for 2nd and 3rd place. Czech rider Pavel Zajic crossed the line first, closely followed by Pete Connolly and Jakub Rod with only a few wheel lengths difference. You can see photos from all finalists (before and after their run) on our Instagram/Facebook. The race was over by 4 in the afternoon, the earliest we had ever finish a race at Kozakov. There were no serious crashes on finals day, the weather was dry/sunny/awesome the whole week, the beer was cheap and at night it was time for the awards ceremony. Luge winner Mikel Echegaray-Diez had to leave early due to work, but to give him some presence, a metal-wire dummy was fabricated on the spot, representing him on the podium. The crowd, which consisted of mostly Czech people who came for the party, went batsh*t crazy when Czech riders Pavel Zajic, Jakub Rod and Vojta Zacek were called to the podium. And it even went louder when Adam Persson was literally brought to the podium, carried in by his Swedish downhill mates, who carried him over their heads, with the Swedish flag in tow. After this the event was officially over and the party could get started, which it did in full effect until the early morning hours. All screenshots taken from video by David Streibl.